Experience the best gorilla trekking safari in Uganda and Rwanda! This trip includes two gorilla trekking tours: one with a fully habituated gorilla family and one with a semi-habituated family (a more wild and authentic experience). Not to mention chimpanzee trekking and an African wildlife safari! 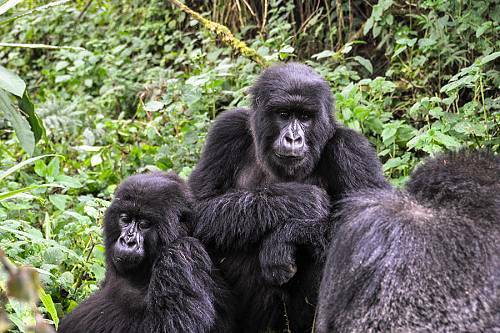 We planned this Gorilla Trekking: Uganda and Rwanda Tour for a family of 4 from Philadelphia. One child had just graduated college and the other had graduated high school, so they wanted to celebrate with this once-in-a-lifetime vacation. This trip was more than a standard gorilla trekking safari—it also included an exclusive gorilla habituation experience, as well as chimpanzee trekking and a safari cruise! 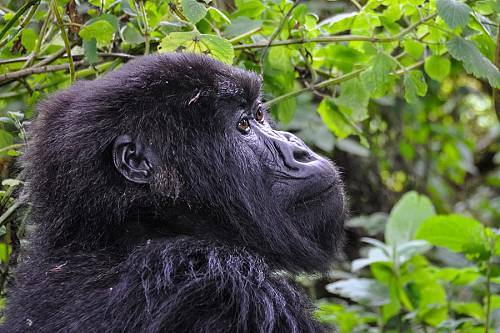 Their Gorilla Trekking: Uganda and Rwanda Tour began in Entebbe, Uganda, where they met their private driver for the trip and made the scenic drive to Kibale National Park. They stayed at the gorgeous Kyaninga Lodge, set against the stunning backdrop of Lake Kyaninga and the Rwenzori Mountains beyond. Here, they headed into Kibale Forest to track wild chimpanzees and had a cultural lunch with a local community elder. Next, they traveled to Queen Elizabeth National Park for a classic African safari. This safari park is home to elephants, hippos, buffalo, lions, leopards, and much more. They started in the eastern part of the park and took a private water safari down the Kazinga Channel. 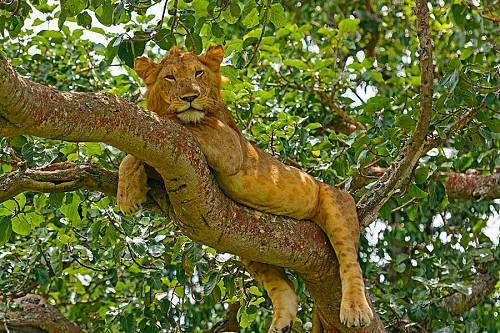 Then they traveled to the southern Ishasha region of the park, which is world-famous for its tree-climbing lions. Continuing their Gorilla Trekking: Uganda and Rwanda Tour, they journeyed to Bwindi Impenetrable Forest for their first gorilla trekking experience! They stayed at Clouds Mountain Gorilla Lodge, a spectacular luxury lodge located high in the mountains, with awe-inspiring views of the misty mountains down below. Their first gorilla trek was a habituation experience, which allowed them to tag along with researchers and spend 4 hours with a family of wild mountain gorillas. Then they traveled south to Rwanda for another gorilla trek in Volcanoes National Park. This was a more typical gorilla trekking safari, where they spent 1 hour with a fully habituated gorilla family. They loved having the 2 different gorilla trekking experiences, both of which had their own unique highlights. At last, their Gorilla Trekking: Uganda and Rwanda Tour came to an end. Their private driver dropped them off at Rwanda’s Kigali Airport to begin their journey back home. Welcome to Uganda! Fly into Entebbe and enjoy a transfer to Karibu Guesthouse. Situated in a tranquil area with modern, stylishly furnished rooms, Karibu Guesthouse offers complete comfort. Today, your private guide will pick you up from the hotel and take you west to the beautiful Kyaninga Lodge, set against the stunning backdrop of Lake Kyaninga and the Rwenzori Mountains beyond. Head out to the terrace and relax on loungers while enjoying the jaw-dropping views. After a delicious 3-course dinner, cozy up by the fireplace and prepare for tomorrow’s incredible adventure. After a scrumptious breakfast, get ready to go on an adventure like no other: chimpanzee trekking! Kyaninga Lodge is less than an hour away from Kibale National Park. The park contains some of Africa’s most dense and varied rainforest and is home to 13 species of primates. The star attractions are the 1,500 chimpanzees, but the guided walks also offer the opportunity to see rare red colobus and L’Hoest’s monkeys, as well as the olive baboon, grey-cheeked mangabey, blue monkeys, and bush babies. Following your trek, enjoy lunch at Tinka’s. Tinka is a prominent community leader in the Bigodi district. Receive a warm welcome into his home and enjoy a traditional Ugandan meal, then return to Kyaninga Lodge in the afternoon. Rejoin your private guide today for a short journey down to Queen Elizabeth National Park, Uganda’s premier safari destination. Settle into your room for the evening at Kyambura Gorge Lodge, which is located on the edge of Queen Elizabeth National Park with sweeping views of the rolling savanna, the distant mountains of the moon, and the sunken Kyambura Gorge. This afternoon, enjoy a private boat excursion along the Kazinga Channel. Have your camera ready to capture the many animals that come to cool off at the waters’ edge, including lions, buffalo, hippos, elephants, and leopards. Today, your private guide will drive you through the wildlife-rich Queen Elizabeth National Park to the southern Ishasha region—home to the famous tree-climbing lions of Uganda! Spend the evening at a fabulous wilderness retreat where you’ll be able to see elephants bathing in the river and adorable monkeys frolicking around the property. Enjoy a scenic drive down to Bwindi Impenetrable Forest today. Tomorrow, you’ll embark on a gorilla trekking safari in the jungle, but today, you can simply enjoy the natural beauty of the region. Make your way to Clouds Mountain Gorilla Lodge, a stunning property that offers sweeping views of the lush mountains below. On a clear evening, you’ll even be able to see active volcanoes glowing in the distance! Enjoy a delicious dinner and relax by your fireplace in preparation for tomorrow’s adventure. It’s time for the highlight of your journey: tracking some of the world’s last remaining wild mountain gorillas in the thick, mysterious jungles of Uganda! On a standard gorilla trekking tour, you would spend an hour observing a gorilla family, but today you’ll enjoy a gorilla habituation tour, which gives you four hours with the gorillas. This experience is a little more wild and authentic than your standard gorilla trekking tour. Join researchers and trackers to find a family of wild gorillas who are not yet fully used to a human presence. Get firsthand insight into the researchers’ work and spend an extended period of time watching the gorillas interact with each other. Today, your guide will drive you across the border to Rwanda and the magical Volcanoes National Park. Your home for the next 2 nights is a cozy lodge situated in the foothills of the mighty Virunga Mountains. Settle into your spacious cottage and soak up beautiful views of the rolling mountains below. Embark on another gorilla trekking safari today to spend more time with these gentle giants. Spend an hour with a habituated Virunga gorilla family; you’ll observe that their fur is thicker and fluffier than that of the Ugandan gorillas. Since this gorilla family is fully habituated, they will completely ignore your human presence so you can observe them as they behave naturally in the wild. Your incredible gorilla trekking tour comes to an end today. Your guide will drive you through the mountains to the Kigali Airport, where you’ll catch your flight back home. See nature’s most fascinating creatures, chimpanzees and gorillas, in their natural habitat on this Ultimate Ugandan Wildlife Safari. Encounter wild mountain gorillas in the Rwandan jungle; see lions, cheetahs, elephants, and much more on a Serengeti safari; and explore the Ngorongoro Crater and Lake Manyara on this bucket list safari vacation! Explore the wild, beautiful, and diverse landscapes of Uganda on this amazing gorilla trekking safari. Discover the unique wildlife of Africa in Murchison Falls, Queen Elizabeth National Park, and Lake Mburo. Plus, enjoy chimpanzee trekking in Kibale and gorilla trekking in Bwindi!